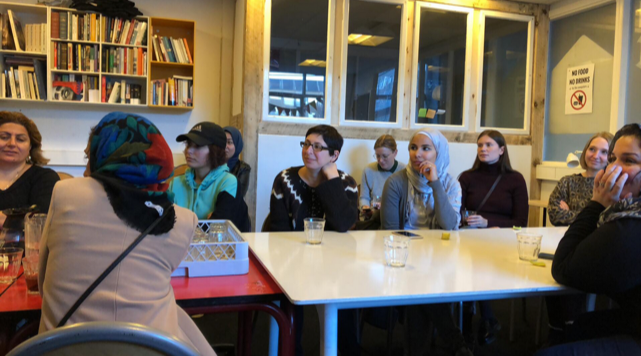 Folkebevægelsen for asylbørns fremtid (The People's Movement for Asylum-Seeking Children's Future) is having its bi-annual meeting, where we are planning campaigns and activities the coming six months. (Citizens' Proposal) to grant rejected asylum-seeking children and their parents temporary residence permit max. two years after their final rejection if the authorities haven't been able to deport them. Anyone interested in joining the movement is welcome! Check out the event here! If you can't make the meeting this month, no problem. The information meeting is repeated every first Wednesday of the month from 5–6:30 pm. People who are already interning or volunteering, but have not yet attended the info meeting, are also very welcome. You can check out the program here! Women's Class: what are refugee and immigrant rights? Every second and third Friday, Women's Club organizes a Women's Class for women only. Each class will focus on a specific topic of relevance to asylum-seeking women, refugee women, migrant women, and trafficked women that we will discuss in-depth. This week, we will continue our examination of human rights. Denmark and the rest of the West have recently tightened their asylum and immigration laws to prevent more asylum seekers and migrants from coming. Denmark has also tightened its integration laws for refugees and immigrants. We will discuss a number of recent integration laws passed in Denmark: the niqab ban, the ghetto plan, and the proposal to ban circumcision of boys. What do you think about these new laws? Is there justice for asylum seekers, refugees, and immigrants in Denmark? What can we do when human rights are not respected by nations and states. There will be translation to Farsi and Danish. Please note that Bible class in Farsi has changed time again, and will now take place Fridays, from 6–7 pm in the Big classroom. Newer PostWeek 47: Support the children in Sjælsmark!